Today’s outfit features a few new favorites paired back with some oldies (but goodies). I recently picked up this pretty pleated skirt at Nordstrom for fall/the holidays (see the sparkle?) and I have already been getting a bunch of use out of it. It’s comfortable and an appropriate length for daytime wear, but with just a hint of sparkle, this skirt can take me through the weekend for upcoming holiday parties! 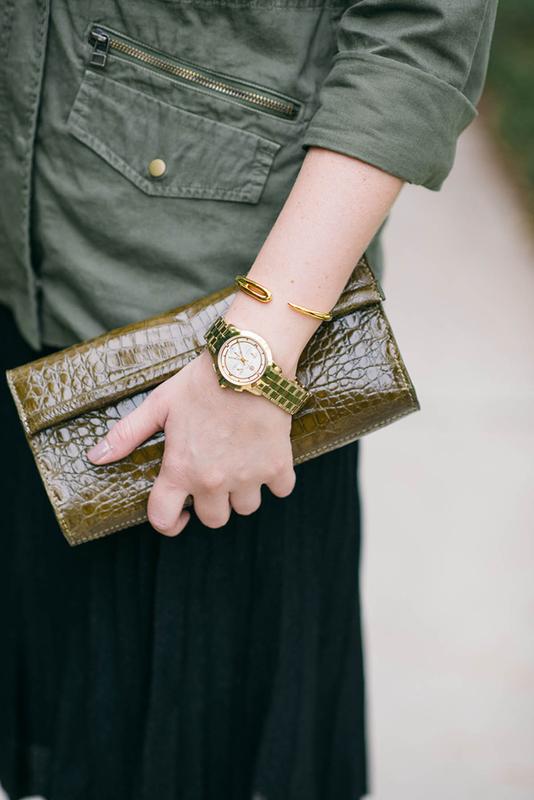 Another recent acquisition is this olive crocodile clutch. While I’d been lusting after this one by Nancy Gonzalez, my mom actually came across a very similar piece while in Argentina last month. Since it looks almost identical and was much less expensive, it was an obvious choice! As far as old purchases go, these Alexander Wang booties take me back to when I first started working at rewardStyle (March 2012) – can you believe they’re over two years old? I can’t. I had them re-soled and buffed up at my favorite shoe repair place in Dallas (after nearly wearing them to death), and they came back good as new! The other piece from the past is this infantry jacket I picked up last year – lucky for you, it’s still available! It’s just such a classic layering piece, especially for these confusing transitional months. I’ve worn it alone as a top and over a tee as a jacket. Shop this staple here. The booties are killer, love AW. Love that pleated skirt, so perfect for the holidays! Love the pleated skirt. Olive and black is such a great combo. 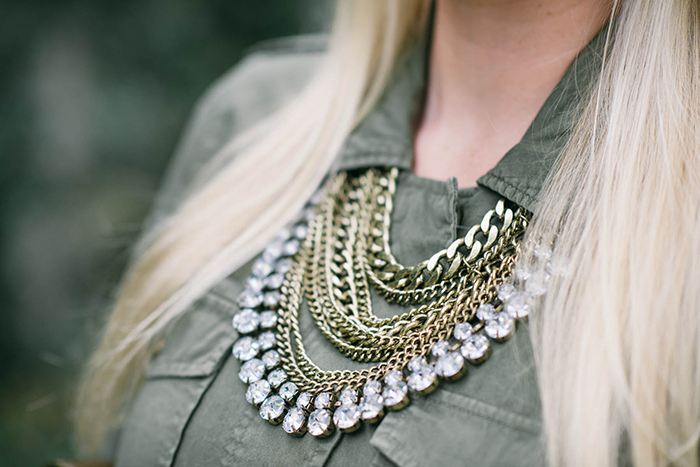 Your bib necklace stands out so well. Love it! Woo! Love how the photos turned out! You look great! Love the jewels and clutch! That olive green looks great on you too! I love the mix of the casual jacket with those amazing heels and skirt! And the clutch is beautiful as well! I’m obsessed of this mix of feminine and utility! Gorgeous look. Loving this fab outfit. Perfect skirt for the holidays, too! Army green jacket is a must! Love the feminine touches to this look. love this pairing!!! I have a black pleated midi and a utility jacket but never thought to put the two together…now I definitely will bc this is a style success. Love the statement necklaces too. Perfect. I love that your are mixing old and new! It is so hard to keep up with buying clothes that are stylish, but if you invest in the classics like you have, you can always wear them! Love the femininity of the skirt and the rougher edge of the jacket! Loving the balance of casual and polished. That utility jacket is a wardrobe must! So versatile and functional. And that pleated St. John skirt is exquisite! 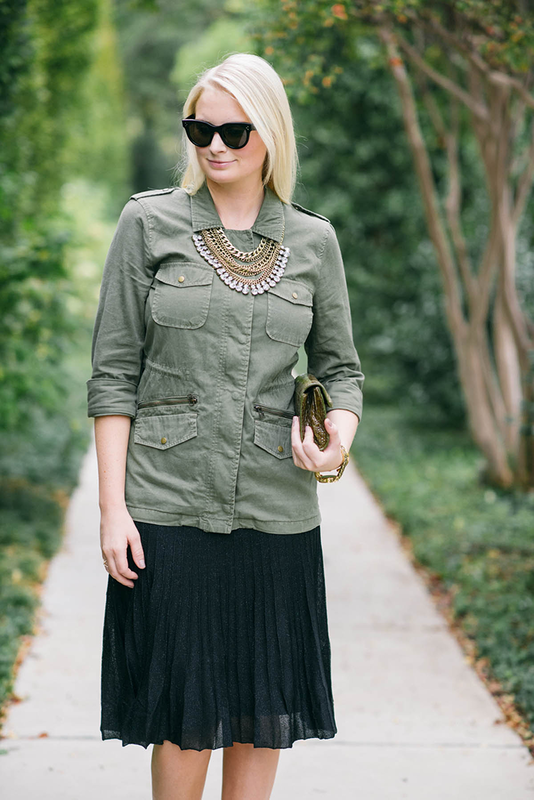 Love the utility jacket paired with the feminine necklace! Love mixing the old with new, and you did a great job of it here. I love how you made this jacket into a shirt. i really love the accessories too! Love this outfit, especially the booties, those are so so good!